Jason King is an agent for Department-S.
Long before Scully and Muldar investigated cases from the X-Files, Jason King and his associates checked out bizarre and unusual matters that affected international peace and security. Working for an organization called Department S, connected somehow with Interpol, King worked for Sir Curtis Suretse along with an American named Stewart Sullivan and a fellow Brit named Annabelle Hurst. They operated out of Paris though their missions took them to strange places. The two-book series about this hero has a slightly strange lineage, which considering all the facts is rather appropriate. In 1969, ATV brought to British television an hour-long adventure series about the people of Department S. It contained 28 episodes and lasted one season. The cases were strange, captivating, and confusing but of even more fun that the missions were the characters themselves. The actors made them highly entertaining. 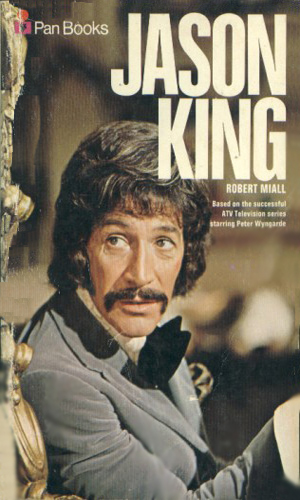 Starring as King, who was just one of the three main agents for the group, was the experienced actor Peter Wyngarde. His portrayal of the character was intriguing enough to both the producers and the audience that when the series concluded its single season, they gave the character/actor his own show. In 1971, King was back, now having left Department S. This series also lasted one year with 26 episodes. Jason King was a bon vivant, a raconteur, and probably many other French phrases. He loved the good life and made the most of it, paying for it by being the author of a best-selling adventure series about a character named Mark Caine. When he left Department S to go off on his own, it was to gather research material for these novels that King traveled about the world and got into all sorts of trouble. Often this trouble was Department S-related as he was often cajoled or simply forced into returning to his own line of work. The British government needs the help of retired agent Jason King, vacationing at a winter resort but he wants no part of it. Persistence and skullduggery with the tax people, however, soon force him into helping just to stay out of jail. Some one or ones is pulling off fantastic robberies all across Europe and the police, along with Interpol, are pointing their fingers at Jason King, a man who just happened to have been where the crimes happened when they happened. *When a plane filled with passengers, one of whom is the Department's chief Sir Curtis, lands in London, the pilot believes they have landed 30 minutes early after a routine flight. They are told that they are, in fact, six days late. The name of an Eastern bloc pilot is found on the passenger list, but he is killed before he can be interrogated. *When a tanker is involved in a crash, the police discover that the tanker is not carrying gas but a living area. The only clue is the driver involved in the accident, who swears he saw an injured woman in the back of the tanker -- a woman who somehow disappeared from the back of the tanker. A lighter with an insignia that Jason recognizes is the only clue left behind. *Four men dressed in costumes are shot to death in a cellar while celebrating a robbery. The investigation shows that the gun of the one dressed as a cowboy had been fired. When an unidentified man's body is found in the trunk of a car fished out of a lake, the Department discover who the gun was used on -- but not why, or what the connection is to a World War II German field marshall's baton. *A young woman who is scheduled to participate in a beauty contest takes a sleeping pill and turns in early. When she awakens the next morning, she discovers that everyone in her village has disappeared. The only clue the Department can find is a mailbox with a fresh coat of paint on it. *A call from Skytripper 190 comes into the control tower, requesting auto land clearance. The control tower doesn't understand why; and, when the plane lands, airport officials discover that it is totally empty. Annabelle discovers a photograph of a reclusive industry CEO boarding the transcontinental flight in New York, but his name is not on the passenger list. The only other thing the Department finds is the body of the flight's pilot in a warehouse. *A real estate agent brings a prospective buyer to a warehouse. When they go inside they find a lavishly constructed replica of a living room with bars across the door, and inside a woman's corpse and a crazed man. The man is murdered in the mental hospital before he can reveal anything except the name of a woman. *Stewart is a spectator at a golf tournament. The golfer leading the tournament fails to show up for his tee time and is later found dead. While it initially appears to be an accident, the theft of the man's golf clubs leads to a trail of murder and smuggling. *A chef disappears en route to an opera. When he is located in Mexico three days later, still in his formal wear, he has no idea of what happened to him. The Department discovers that the man was mistaken for someone else, but by the time they realize this, the other man (a scientist) has disappeared. The only clue the chef can give them is turtle in the shell, a clue that sends the Department to Jamaica. *A limousine is stopped with a land mine and riddled with machine gun fire. The Department investigates because the assassination victim turns out to be a wax dummy. The mannequin, nicknamed "Charlie Crippen" by Jason, apparently was mistaken for a real person. The Department has to find out who the intended victim is and who is behind the assassination plot. *Two men kill each other after retrieving a plastic fish hidden in the ocean off the coast. The fish is loaded with $100,000 in American money. The Department's investigation leads to an international counterfeiting ring. 11 Department S: Who Plays the Dummy? *A policeman attempts to pull over a speeding car. When the car crashes, the policeman discovers the man behind the wheel is actually a dummy. Stewart and Jason, already in Spain, are called on the case. They discover the "how" -- remote control -- but also discover that the local authorities are hindering their investigation. *A man sneaks into a very secure, heavily guarded estate and glues a theatrical mask onto a sleeping man's face. The man awakens the next morning, sees the mask, and suffers a fatal heart attack. As the deceased man was a friend of Sir Curtis Seretse, the Department is called in to investigate who was responsible for the prank -- and, more importantly, why. *A man is ordered to take a deliver a package to a person in Paris. After the man?s boss is killed in an exchange of gunfire, he opens the package to discover three flowers and a message written on the paper. A number of people, including the Department, want to know what the three flowers and cryptic message have to do with an unsolved bank robbery. *A chemical company's manager tells the police that no one showed up for work the previous day, yet the neighbors of the company all claim the factory seemed to have had a perfectly normal day of operation. The Department finds that one worker who did show up for work has been murdered, and there is a tie to a nuclear-powered generating station's opening. *A photographer presents a man with a picture of a man taken in a festival crowd. People break into the man's house to kill him, but he dies of a heart attack. The criminals then go to the morgue -- and shoot the body. These actions center around a notorious criminal named Christopher Lomax, thought dead for three years. The Department wants to know who was behind the attack on the corpse; and, more importantly, if Lomax is indeed still alive. *A plane landing at the airport kills a man who was wandering on the runway. The man had developed a brainwashing technique. The Department is afraid the device has fallen into the wrong hands. As they investigate, however, Jason and Stewart find themselves victims of the brainwashing machine. *Someone kills a subway car filled with people on their way home with nerve gas. The widow of one of the victims is kidnapped while at the morgue with Annabelle. Jason is also abducted, leaving Stewart and Annabelle to solve why it happened and who did it -- and how a "Stop Hitler Now!" poster figures as a clue. *A professor's wife is gunned down in a seemingly random act of violence. The man is distraught, but becomes more distrubed as he begins to see his dead wife and receive phone calls from her. The Department is put on the case -- but Sir Curtis will not tell them why the professor "is an important man to the world." *A couple in a car discover a dying man in a spacesuit staggering toward their auto. Stewart investigates at a company that manufactures spacesuits, but an attempt is made on his life once he discovers some spacesuits are missing. Jason, meanwhile, poses as an American safecracker to solve the case. *A mirror at an auction sparks a bidding war. Sir Curtis, who is in attendance at the auction, calls the Department to investigate why a relatively inconsequential mirror would sell for ?9,000 -- and why the man who bought the mirror was murdered shortly after the purchase. *The lead brain surgeon operating on a British official is knocked unconscious and replaced with another man. The surgery is not botched; to the contrary, the replacement surgeon performed flawlessly. The Department wants to know why someone would replace a surgeon, while Jason investigates a connection to Istanbul. *A plane explodes over the English Channel with a British diplomat aboard. Although a number of witnesses on a ferry boat saw the plane explode, Sir Curtis is convinced the man is still alive and was serving as a double agent. The Department has to track him down before the Russians do. *A pilot announces a flight bound for Athens is underway. As the flight progresses, a man shoots another passenger. He then opens the plane door and jumps -- to the floor of a warehouse. The Department needs to figure out who the murdered man was, and why anyone would construct a set to make people think they were on a passenger plane. *A distraught young man commits suicide in a London park after throwing his passport away. What would be considered a routine case becomes Department material when the coroner rules, without question, the youthful man was in fact 60 at the time of his death. The case becomes more confusing when the dead man's body is stolen from the morgue. *An Interpol agent dies while on vacation in Beirut. Stewart, a close friend of the dead agent, does not believe that his friend, an accomplished scuba diver, died in a scuba diving accident and demands that the Department investigate. Sir Curtis first says no, then relents and allows Jason to fly to Lebanon to investigate. However, he orders Stewart to stay away from the case because Sir Curtis believes Stewart is "far too emotional" to properly investigate the case. *Greg Halliday, a noted chemist, has disappeared. The Department is called on to find him quickly, as he has disappeared with a canister of nerve gas that he helped create. Frustrated with humanity, Halliday threatens to unleash the nerve gas on London. *Upon arrival at a Ministry of Defense compound, a government official's driver discovers that the man he has been transporting has apparently become a skeleton. The Department investigates, but more officials become skeletons -- including the Department's own official, Sir Curtis Seretse. *An elaborate break-in at a customs warehouse on a loading dock results in the theft of one case of fish soup from Portugal. As Stewart and Annabelle are investigating, the case of soup is found outside, discarded. Jason thinks there is a larger crime behind the breaking and entering, so he heads to Lisbon to check the factory where the soup originated from. *When Jason King sets out to sell a series of Mark Caine novels for television, he finds adventure isn't a saleable commodity. *A Jason King novel describing how a man is smuggled across the East-West German border lands its author in a danger-loaded espionage plot! *It's always a chancy business to give a lift in a car to a pretty girl hitch-hiker and even chancier to give one to a released prisoner. Jason King finds the plot for his next Mark Caine novel when he does so! *Jason King pits his writer's imagination against computerized crime - and becomes a Bulgarian master-crook! *Vienna - city of song. But the song has a sinister note for Jason King when rival factions seek to use him as bait to trap a double-agent. Alan Keeble is dead. Or so his girl-friend Greta Weiss believes. *A couple of crooks try to turn fiction into fact by copying the crimes created by Jason King in his Mark Caine books. But can they overcome the fact that Caine always wins? *Jason King is abducted to Moscow to unravel the mystery of three men who have been turned into three tidy piles of ashes. He creates his own Phoenix. *A red rose has a dangerously prickly thorn for Jason King when it identifies him as a hired killer! *A rare and valuable golden Cellini is stolen - and the debonair Jason King find his love life interrupted seven thousand miles away. *The search for the missing Cellini antique switches from Paris to Rome, and Jason King finds that chasing gold can lead to certain death. *Opposition parties may be essential in a democracy, but in a revolution they only get in the way - and Jason King finds himself in the centre of a Caribbean revolutionary merry-go-round. *Jason King falls in love with a gangster's girlfriend - and finds that the arrows of of love can lead to death. *Jason finds himself involved in an attempt to burgle the British Museum after he is hypnotized by a beautiful woman. *Jason receives a shock when shown newspaper cuttings with pictures of him in Istanbul. But he is in Paris. Who is impersonating him - and why? *A beautiful girl may be able to set a trap for a man's heart - but it takes more than beauty to bemuse the wits of a man like Jason King! Crooks who seek to use him as a dupe provide him with a glamorous companion. *The King becomes a pawn in a revolution - but does he really hold the key to the secret both sides are seeking so desperately? Why should the Government of a South American republic be so anxious to get Jason King to its country? *A visit to a German health farm proves to be far from healthy for Jason King. But why has he been tricked into going there? *A dead man's Russian accent, a ten-year-old kidnapping and a pretty girl combine to put Jason King in peril. *An old woman is the cause of a girl being accused of murder. Jason must deal with the sweet old lady who has embroiled a young woman as the prime suspect in a crime. Other lead includes a stolen vacuum cleaner. *Jason visits Venice and is given a prize for a book he has not written which tells a real-life story of crime. *Jason dallies with a princess, but racketeers take a rap at romance. *Jason King finds that a cartoon strip based on his own Mark Caine characters has sinister implications when translated into Chinese. *Dolce Vita-type parties, blackmail and murder are the ingredients of the latest Mark Caine book Jason King is writing - but everything he creates is actually happening. Has he suddenly become clairvoyant? *Jason deliberately walks into a trap in order to find the president's kidnapped daughter. *A film script strangely comes to life and Jason finds himself at the centre of it. *A bogus Jason King sets a problem for the adventure loving author when he sets out to kill a gangland boss. 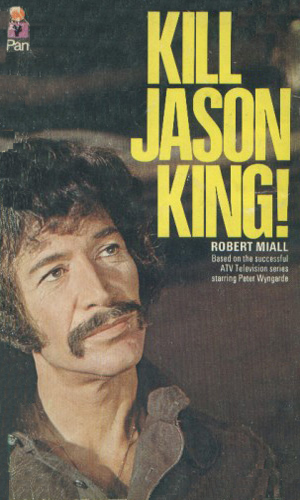 But it saves the real Jason King from the danger of marriage! The two novels about Jason King was written with the same light air that the television show enjoyed and therefore as just as fun to read. King is considered to be an exceptional ladies man and the books confirm it though the encounters are all PG rated as would befit the times. Fans of old television shows will enjoy these books as will anyone who watched either Department S or Jason King. King is a bit full of himself at times but that is what makes the character so fun. Episodes of the two shows are very hard to find but if you get a chance, watch just for nostalgia sake. I've only seen one episode of Jason King and it was a fairly humdrum if swanky take on 70s Britain with a bit of spying thrown in. The books are tosh, lacking any sort of meat on bare bones. For dedicated fans only.